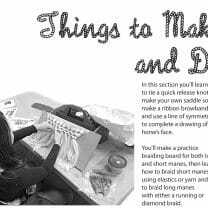 Have you sometimes dreamed of working with horses when you grow up? For many people, if it were to happen, it would be a dream come true. Over the past eight years, the Missouri 4-H has organized an Equine Career and Horse Industry Tour to help teens do exactly that, couple their passion for horses with a career. First group pick up time. 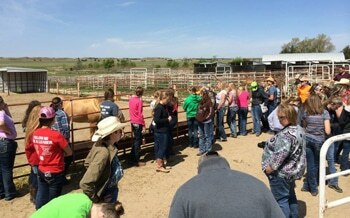 On Tuesday, May 20th, fifty-one Missouri 4-H teens embarked on the annual 4-H Equine Career and Horse Industry Tour, traveling to destinations in Kansas, Nebraska, Wyoming and Colorado. 1. The first group was picked up at the time shown on the clock to the right. What time was the first group picked up? Be sure to include a.m. or p.m. in your answer. An hour later the next group was picked up, then the third and last group was picked up an hour after that. 2. What time was the third and last group picked up? Once the final group was picked up, it was time to head out on the road! One hundred and thirty-five miles later, the bus pulled into Kansas State University where the group had lunch before visiting the Equine Science Department. For those participants curious about what is involved in studying equine science at university, this first stop was an exciting place to start the tour. The Kansas State program offers fourteen equine-specific courses. 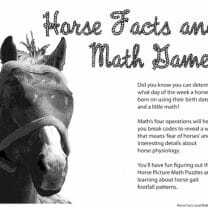 Some are lectures, meant to improve knowledge of basic and applied equine science, while the labs provide opportunities to improve common management, handling, and training techniques, all of which are crucial in developing good “horse sense”. Participants also learned about the Equine Science Certificate Program which is designed to increase the number of potential job opportunities in the equine industry to the student whose field of study does not already include equine related courses. The program also provides the opportunity for pre-vet students to increase their equine knowledge and horse handling skills. Back on the bus and two hundred miles later, the group rolled into Grand Island, Nebraska for the night. They had lots to talk about, excited by the opportunities they had seen during the day, some of them imagining themselves studying horses at university! 3. How far did they travel the first day? The next day it was on to the ranching and rodeo world at the renowned Pitzer Ranch. This ranch was the home of Two Eyed Jack, a Quarter Horse stallion and showhorse that became the leading all time sire of American Quarter Horse Association (or AQHA) Champions. Two Eyed Jack is the all time leading sire of AQHA Champions, having sired 119 Champions. He was inducted into the AQHA Hall of Fame and died on 1991 03 02. 4. The date above is written in metric notation. In what month did Two Eyed Jack pass away? 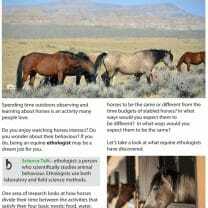 The next day’s focus was on equine welfare issues. After breakfast the group boarded their bus at 8:00 a.m. for a 1 hour and 45 minute drive to their first destination, the Elm Creek, Neb., Bureau of Land Management (BLM) wild horse facility. 5. What time did they arrive at the Elm Creek facility? The next stop on the tour was a visit to an equine rescue facility where the group helped with morning chores. Checked out time at the hotel, shown on the clock to the right, gave everyone an early start on what would be a busy fourth day. 6. What was check out time? Just a half hour later the 4-Hers found themselves being guided on a special behind-the-chutes tour at the famous Cheyenne Frontier Days Rodeo in Cheyenne, Wyoming. 7. What time did they behind-the-chutes tour start? Include a.m. or p.m. in your answer. This same stop included an hour visit at the Frontier Days Rodeo Museum before returning to the bus at 11:00 a.m for the drive to the state line and on into Colorado. 8. What time did the group begin their visit to the museum? Next stop, a tour of the Colorado State Equine Science Department. 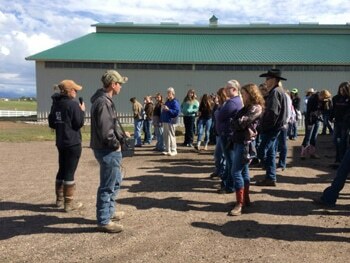 Here participants learned that over 20 applied courses are offered, covering all areas of the equine industry. The Equine Sciences program offers courses ranging from Exercise Physiology and Foaling Management to Trail Riding and Packing & Outfitting! Click here if you would like to see the full list of courses. And the day wasn’t over yet. Time to climb back on the bus and head over to see the Mile High Vaulters. They were scheduled to see a vaulting demonstration at the time shown below and they did not want to be late! 9. What time was the group scheduled to visit the Mile High Vaulters? Include a.m. or p.m. in your answer. Day five was another full day of activities. The group watched morning practices of the famous Westernaires, a youth drill and trick riding troupe before heading over to the Denver Polo Club. The bus arrived at 11:00 a.m. Everyone got a chance to learn about polo, handle polo mallets and hit a few balls around before a picnic lunch at the Polo Club. Two hours later it was time to climb back on the bus for an hour and a half drive to their next destination, Sombrero Stables, for a 3 hour trail ride in the Rocky Mountains! 10. What time did the bus leave the Denver Polo Club? Include a.m. or p.m. in your answer. 11. What time did the bus arrive at their next destination? Probably the highlight for all was a trail ride in the Rocky Mountains near Estes Park with a steak dinner on the trail. “Always follow your dreams” was the special message delivered by Kate Tweedy, daughter of Penny Chenery, owner of Secretariat, who visited with the group. Over the past eight years, this equine tour has helped more than 500 young horse lovers make informed, educational decisions regarding their future with horses. After a trip like this it is easy to see why. Some of the participants felt more clear on their future career path. For many on the trip, their dream became more real. 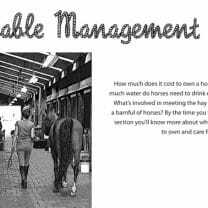 Are you considering studying equine science when you get older? Click here to learn more about Equine Science at Colorado State University. Would you like to learn more about mustangs like the ones the 4-Hers saw at Elm Creek? Click here for a post about the Mustang Gals, three friends who live in Nevada and are working hard to save America’s wild horses. 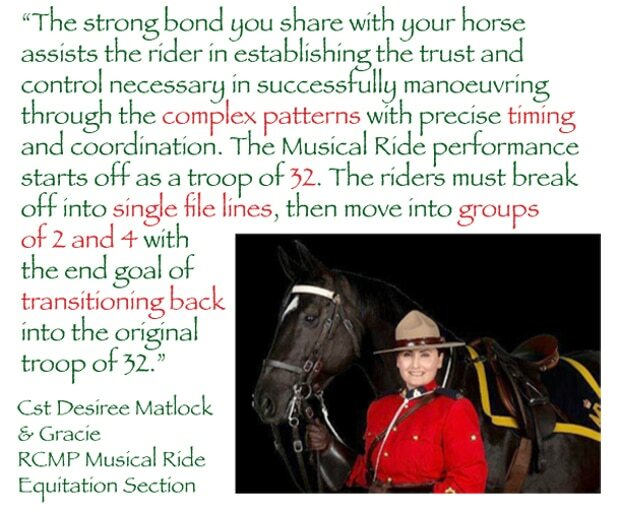 Click here if you would like to read more about Sombrero Ranch and trail riding? Answer: 135 miles + 200 miles = 335 miles. They travelled 335 miles the first day. Answer: Two Eyed Jack passed away in March 1991. 7. What time did they behind-the-chutes tour start? Answer: The group had to be at the bus at 11:00 a.m. They had one hour in the museum, so their tour of the museum began one hour earlier, at 10:00 a.m.
Answer: The left the Denver Polo Club at 1:00 p.m.
Answer: The bus arrived at 2:30 p.m.
PreviousPrevious post:It’s Time to Bring in the Hay!NextNext post:How Important is a Properly Fitted Saddle?